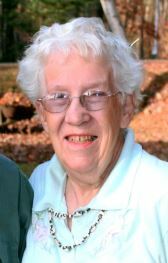 SOUTH PARIS - Lois H. Day peacefully passed away at Market Square Health Center, Feb. 3, 2019. SOUTH PARIS – Lois H. Day peacefully passed away at Market Square Health Center, Feb. 3, 2019. She was born April 14, 1928 at Rumford Corner to Lester and Ismay Hathaway of Bryant Pond. In 1947, she married Leroy D. Day and they had four children. She watched them play in many brooks and rivers. She fried many a brook trout. She was well known as a dowser. In 1977, she graduated from nursing school at the age of 49. She and Roy, along with her brother, John and his wife, Althea enjoyed square dancing and traveling in the States, as well as abroad. She was a proud member of the American Legion Auxilary for many years. Mum was the caretaker of many and was known for her green thumb. The Gore Road never looked as good as in her day. She is survived by her husband of 72 years, Roy, of Bryant Pond; son, John C. Day and his wife, Susan of Bethel, daughters, Amy Smith and Mary Day of Bryant Pond; her sister, Alice McGinnis of North Carolina and sister-in-law, Althea Hathaway of South Paris. She was “Gram” to nine and great “Gram” to 12. Lois was predeceased by her son, George and six of her seven siblings. She will be sorely missed by her family and friends. The family would like to thank the wonderful caretakers of our mom at Market Square and Ledgeview facilities as well as Beacon Hospice for the support needed for her last journey. Memorial services will be held on Sunday February 10 at 2 p.m. at the Jackson-Silver American Legion, Gore Road, Locke Mills with Pastor Sondra Withey officiating. Arrangements by Cliff Gray Cremation & Funeral Services, 60 Andrews Road, Bryant Pond.